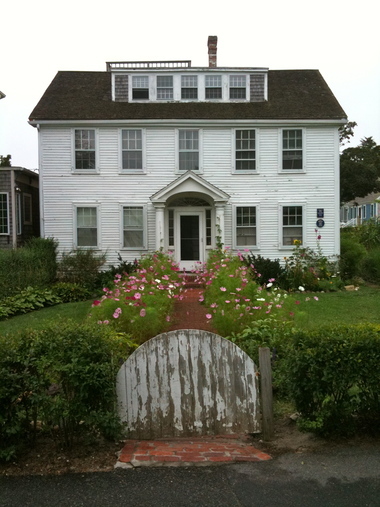 On a gray summer day, we ventured into the streets of Provincetown, at the tip of Cape Cod Massachusetts, for a stroll around some wonderful gardens. Tropical Oasis. A delightful small garden with big, bold leaf textures and colorful blooms. Tender tropical plants are well placed in pots between Cape Cod hearty plantings. Cottage Garden. 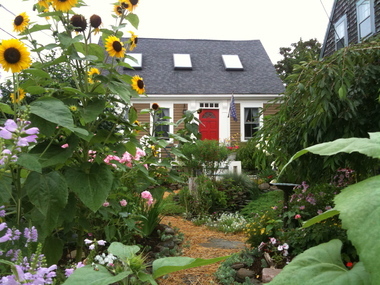 The red door anchors this whimsical cottage garden, peppered with fantastic sunflowers and flox.The path that winds through the garden has hay between big stepping stones for a casual but cool effect. Simple Cape. The weathered gate leading to a simple brick path lined with a riot of cosmos… love it! Nice & Precise: Part 1. This show stopper is a jewel box of perfection. Simple but bold window boxes flank a huge American flag on what looks to be an Americana stage set. Nice and Precise: Part 2. 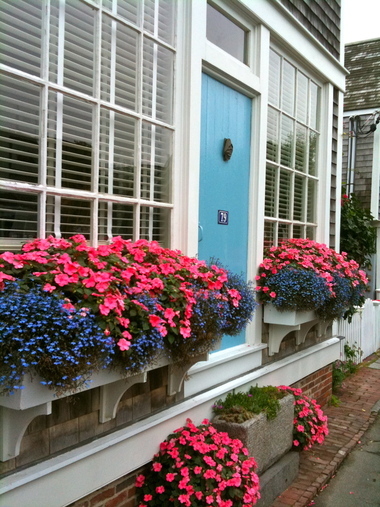 A magical robin’s egg blue door flanked by brimming window boxes faces the street. Nice and Precise: Part 3. Out of place, but oh so cool, this stone planter is part of the curb with a nice display of succulents. 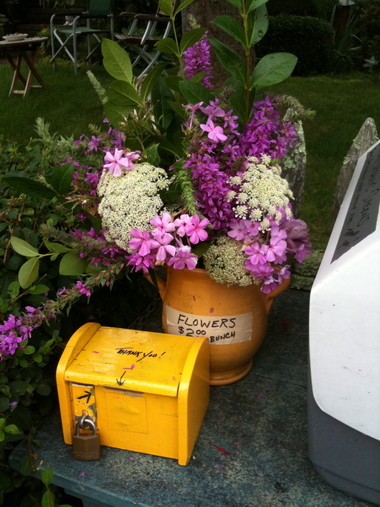 Neighborhood COOP. Just down the street, the t-shirt vendors and bars cater to throngs of tourists descending on P-Town… but just up the road, the scene melts into a small New England village where everyone knows each other and neighbors share. Unconventional Rock Garden. In an otherwise plain landscape, incredibly creative displays of collected rocks are worthy of attention. 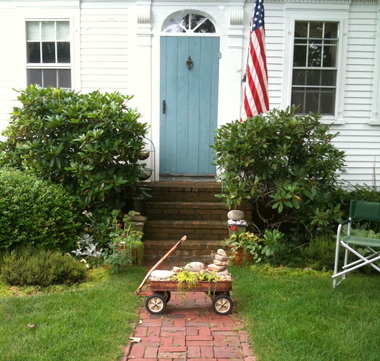 The old radio flyer wagon planted with irish moss and rocks is my favorite! Technicolor. 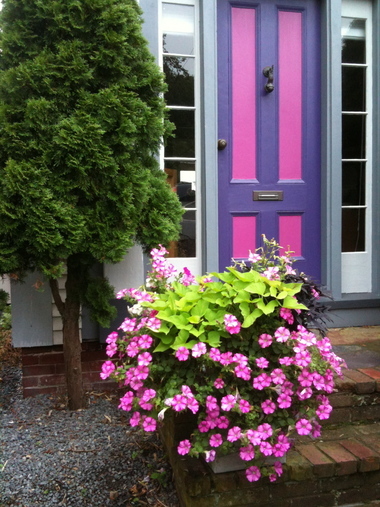 Ancient New England structures are given new life with bold colored doors and complimentary containers. 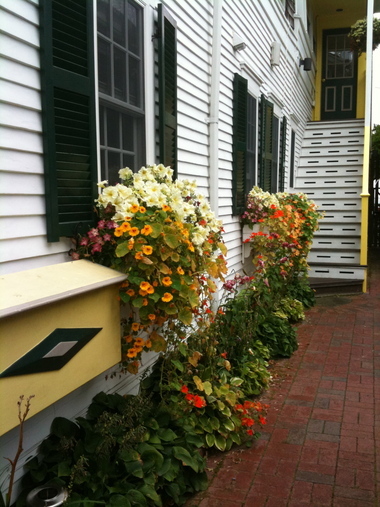 Color Coordinated Window Boxes. 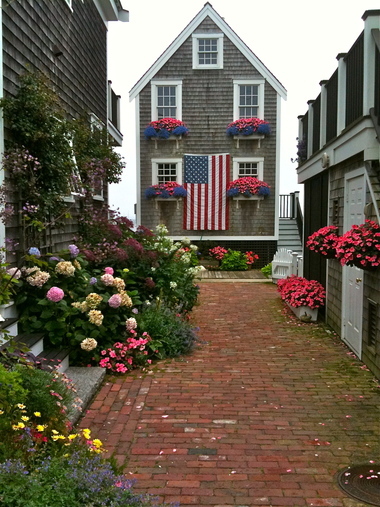 Like a matching outfit, this neatly painted house has designer window boxes brimming with flowers that bring out the accent color used for the trim paint. Zen Meets Country. 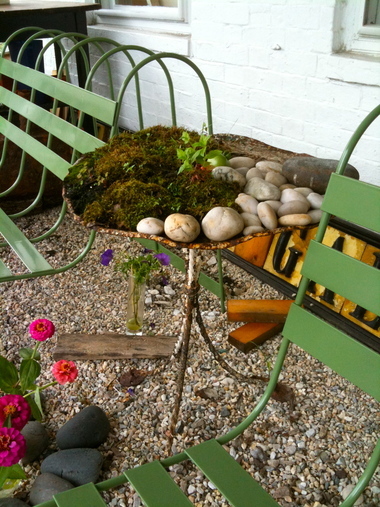 This modern art gallery has a wonderful pea gravel pallet where an eclectic mix of folksy rod iron furniture is interspersed with zen rock arrangements and singular plantings. 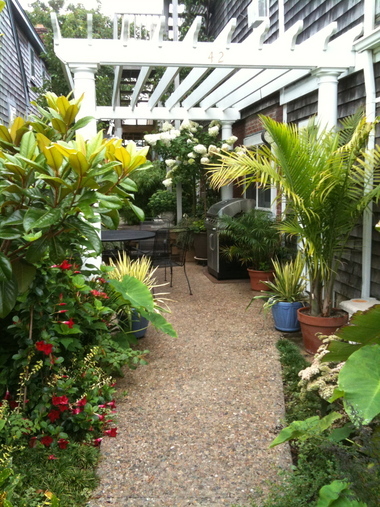 The garden also features interspersed vegetable plantings for a modern-green-sustainable vibe. Hostas in a Pot. Hostas have to be one of the most versatile plants in the garden… whether its a shade garden, a perennial border, a cottage garden or a tropical oasis, these are awesome performers. 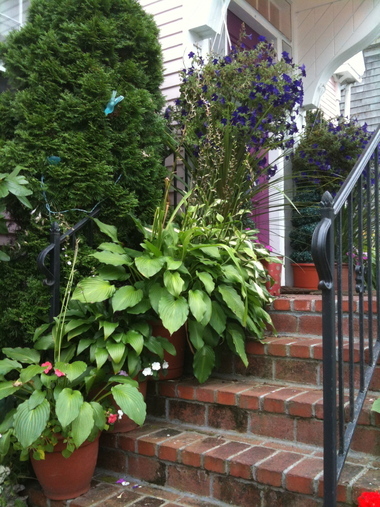 Here’s a pretty simple display of hostas in a pot that just works beautifully. Barbie, Ken and All Their Friends. 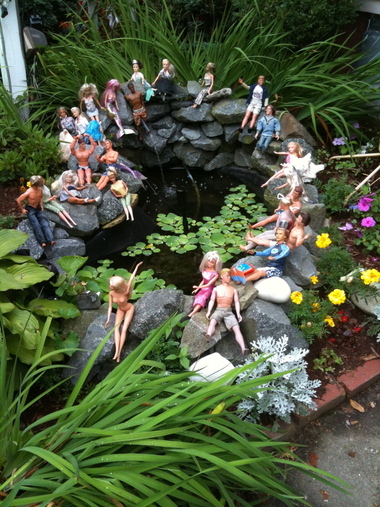 So much easier to maintain, koi are replaced with a collection of Barbie and Ken dolls in this street-side water garden. And those barbie/ken dolls are hilarious. This looks like such a quaint place. I have never been but definitely would love to get there someday. Awesome, Awesome, Awesome...gorgeous photography as well. Keep &#x27;em coming!